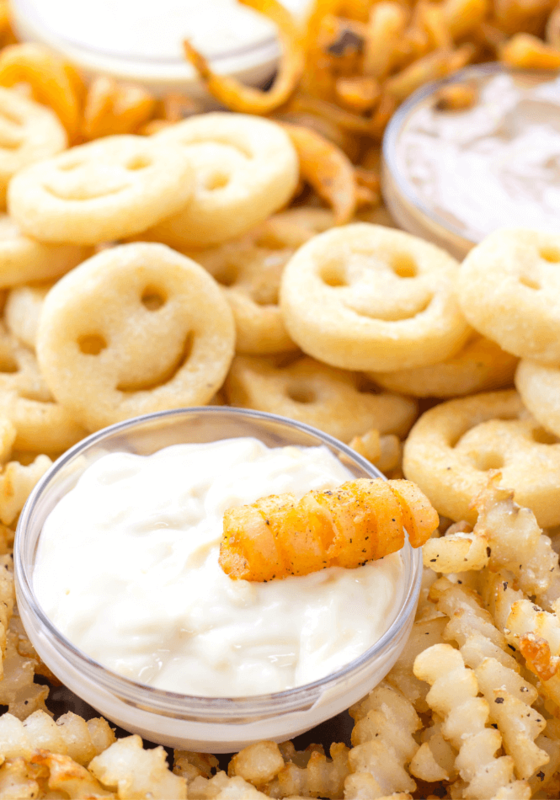 Fries with Garlic Aioli is winning game day snack time with a delicious dip made with mayo, roasted garlic cloves and lemon juice that goes perfect with McCain® Seasoned Curly Fries Seasoned Potato Fries. This time of year is crazy busy in my household between holiday gatherings, Birthday parties, end of year school functions and game day hang outs with friends. 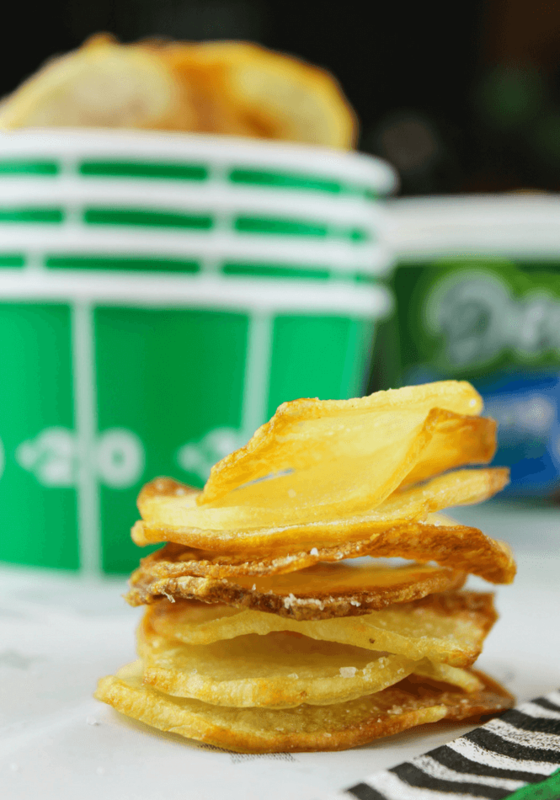 Of course, I love hosting our game day events and one of my go-to spreads are fries with dips. So simple, so delicious and there is something for everyone. One of my favorite fry and dip pairings happens to be McCain Seasoned Curly Fries Seasoned Potato Fries with a homemade aioli. 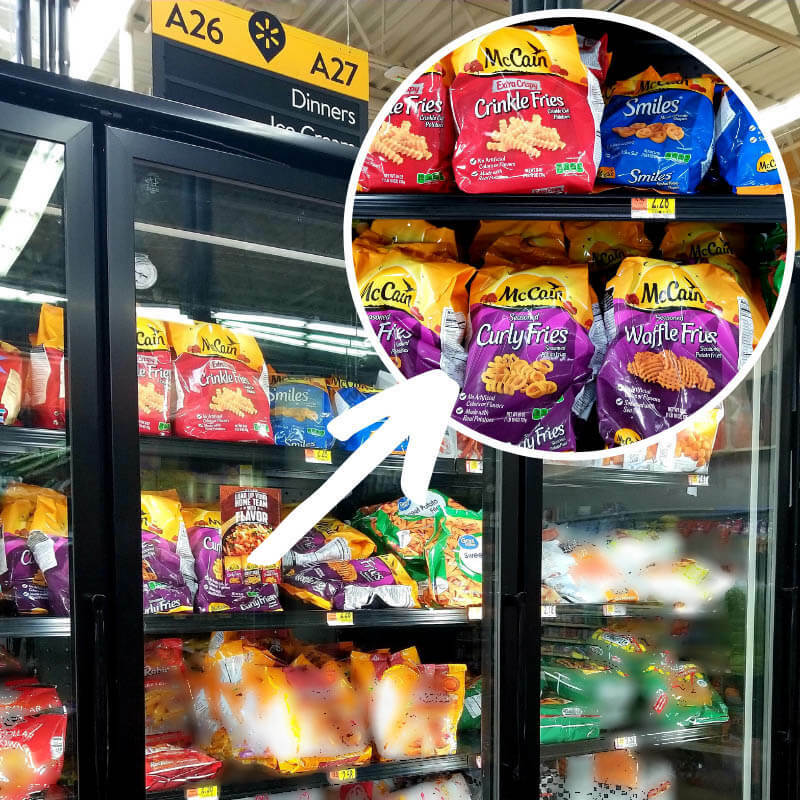 McCain® products are great for dipping and can be found at your local Walmart in the freezer section. You can get $1.50 off when you purchase 2 participating McCain products at Walmart. You can submit your rebate & learn more details HERE. 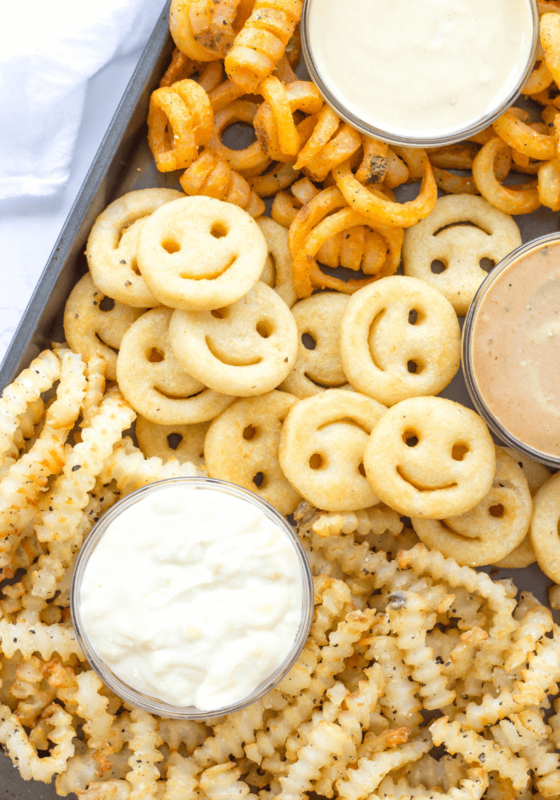 McCain Foods is the world’s largest manufacturer of frozen potato products established in Canada and is on the path to be a household name here in the United States. 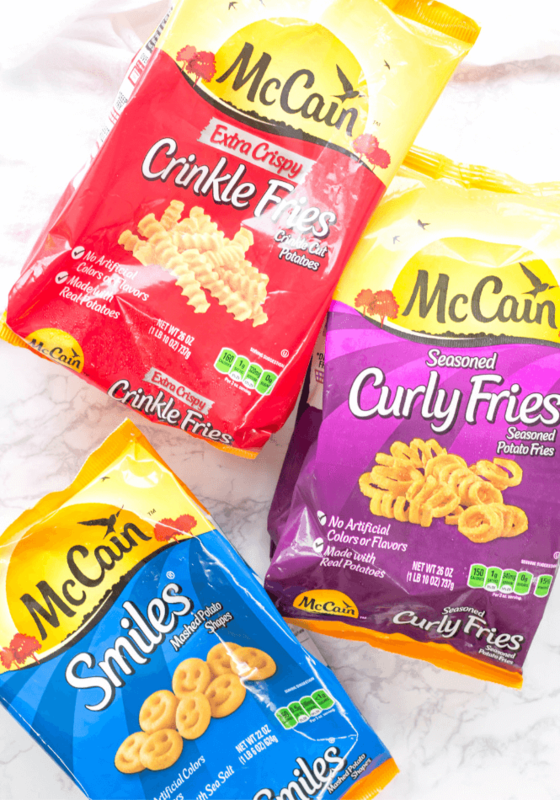 Let McCain products help you easily create a tasty game day spread with the variety of fries all made with real potatoes with crispy exteriors for a satisfying crunch with every bite. Also try McCain® Smiles® Mashed Potato Shapes for super fun shapes that both kids and grow ups will enjoy. Hosting game day doesn’t have to be stressful. Here are my TOP 5 TIPS to make hosting a snap. Use disposable plates, napkins, utensils and cups for easy clean up. Have plenty of drinks and keep them cold so remember extra ice. Finger foods will help you win big with your guests and give you easy party prep and cleanup. Make sure the game viewing area is comfortable and has plenty of seating. Are kids attending? Make sure there are snacks and drinks that are kid friendly. Also, set up a safe play area for the kids to run and jump. Garlic Aioli may sound a little fancy but is quite easy to throw together and adds so much flavor to McCain Seasoned Curly Fries Seasoned Potato Fries or any other McCain fries. You start by roasting a bulb of garlic in the oven with just a little olive oil. 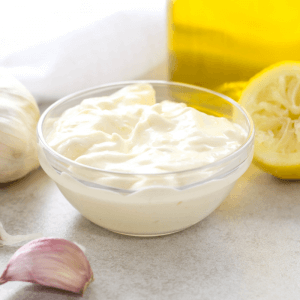 The garlic becomes soft so you can easily squeeze the garlic out of the cloves to add to a little mayonnaise, lemon juice and more olive oil to create a yummy dip. Make all your guests happy with a variety of dipping sauces. You can quickly toss together these other sauces for your fun party spread. Mix equal parts of your favorite tangy BBQ sauce with mayonnaise that is perfect for dunking fries. Honey Mustard is always a crowd pleaser made with equal parts honey, mayonnaise and Dijon mustard. Spice things up with a touch of sriracha in mayonnaise for those hot sauce fans. Add the classics: ketchup, mustard and ranch. 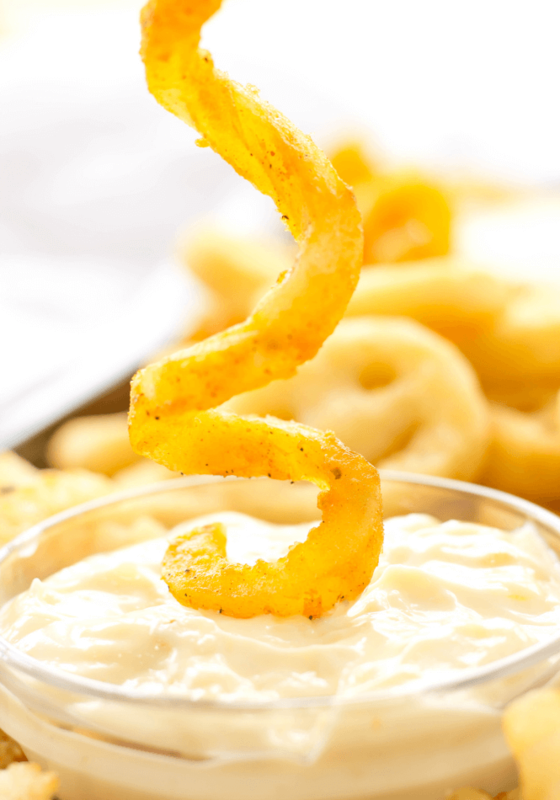 Fries with Garlic Aioli is winning game day snack with a delicious dip made with mayo, roasted garlic cloves and lemon juice that goes perfect with McCain® Seasoned Curly Fries Seasoned Potato Fries. Cut the top off a head of garlic to expose the cloves slightly. Drizzle with olive oil and wrap in foil. Roast for 40 minutes and remove from oven to cool. Squeeze the garlic out of two roasted garlic cloves and mash in small bowl using a fork. Add 1/4 teaspoon salt, 2 Tablespoons olive oil and 1 Tablespoon fresh lemon juice. Mash together well and then stir in the mayo. Store in refrigerator until ready to serve. Cook your McCain® Seasoned Curly Fries Seasoned Potato Fries according to instructions on the bag. I cooked mine in the oven at 425 degrees for a total of 22 minutes. 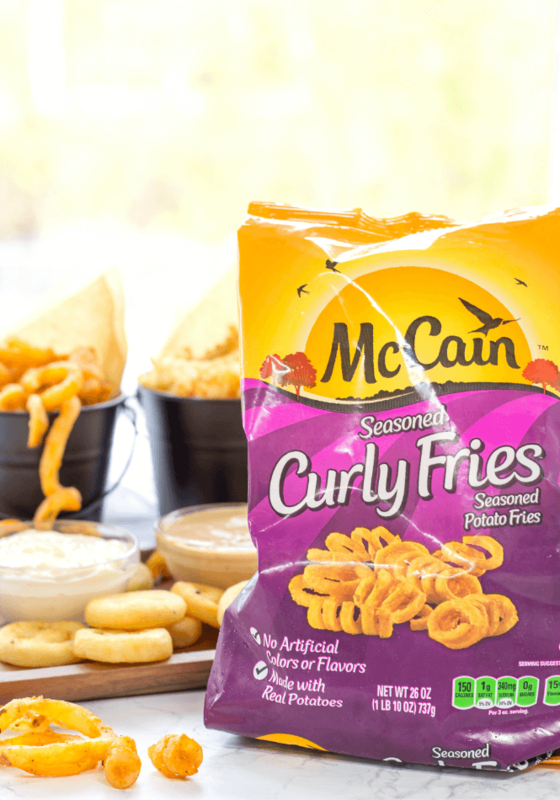 What’s your favorite dip to pair with McCain Seasoned Curly Fries Seasoned Potato Fries? Let me know in the comments below! Homemade Baked Potato Chips are made from russet potatoes, a bit of olive oil and sprinkled with sea salt. Perfectly pair these homemade chips with Dean’s Dairy Dip in one of their new bacon flavors- because everything tastes better with bacon! Football season is coming to a close and the big game is approaching. I am preparing to host the big game and making plans to feed all the guys. The must have food- chips and Dean’s Dairy Dip. Game time isn’t complete without this pair! 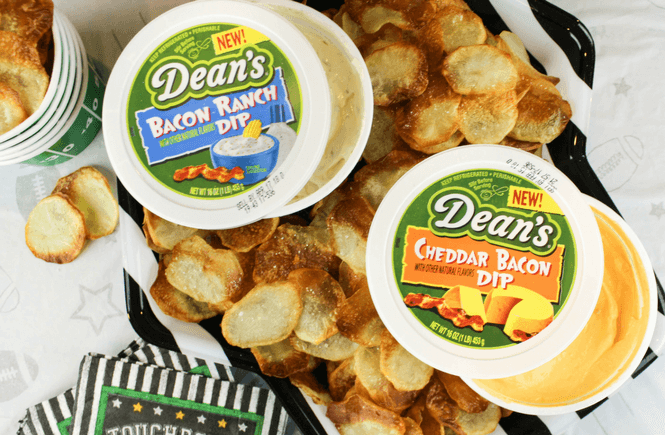 Try Dean’s Cheddar Bacon Dip or Bacon Ranch Dip and give the guys what they want! I really enjoy hosting events and feeding people. Game time events call for finger foods and convenient items. When planning your event, take that into account. What items do you need to make your game time hosting a breeze? Drinks – you can even have your guests bring their own. Bowls to hold all the snack foods. Homemade Baked Potato Chips. Make one potato per guest and you can prepare these the day before the game. Menu ideas: hotdogs, mini hamburgers, meatballs, chicken wings, personal sized pizzas or pinwheel sandwiches. Just a few football themed decorations for the snack table like a table liner and a few paper footballs hanging down. 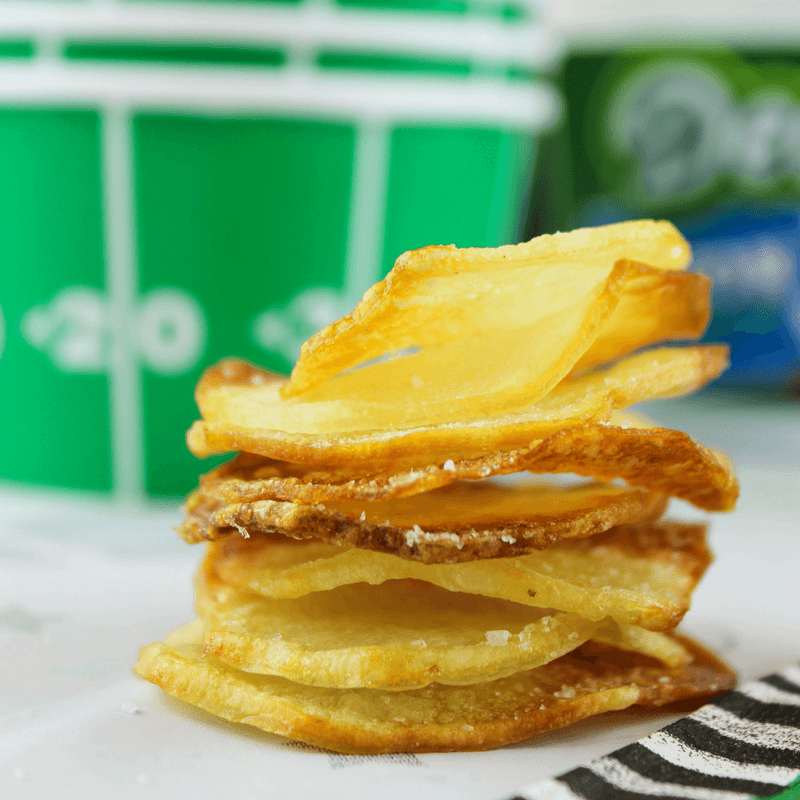 Why choose Dean’s Dairy Dip for your game time snacking? 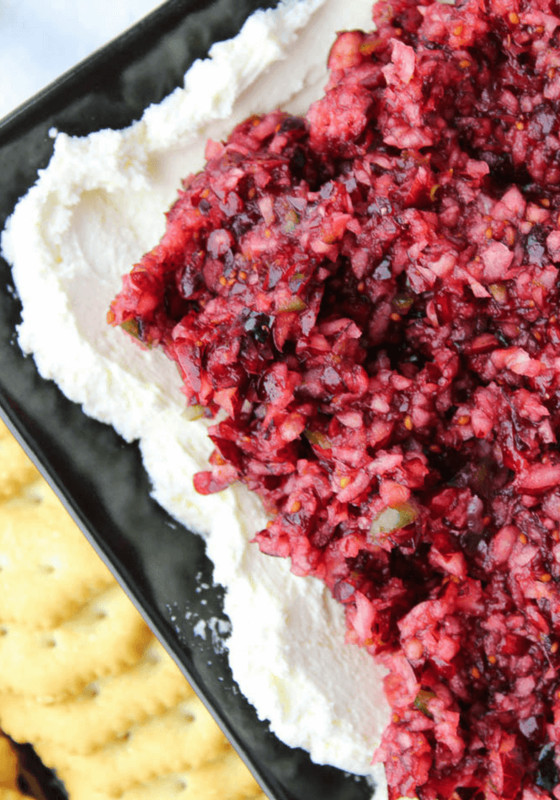 Dean’s Dip is a refrigerated dip that delivers a dairy-fresh taste that guys and gals enjoy. 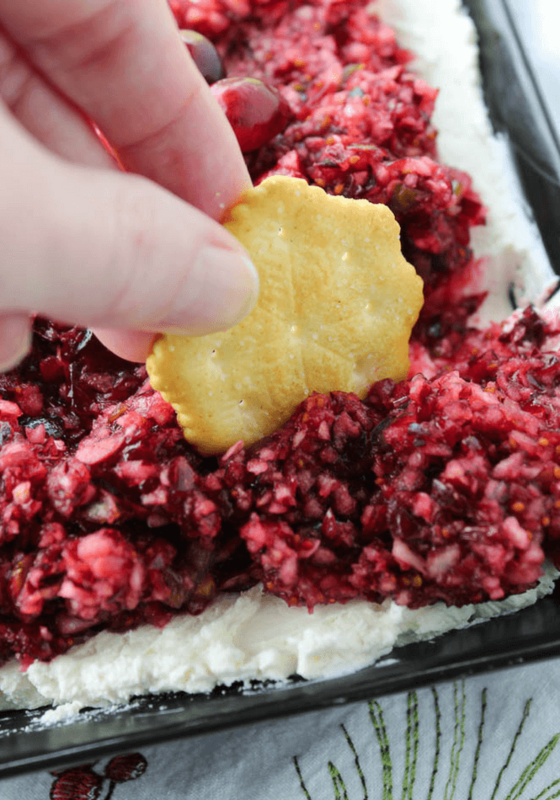 Dean’s Dip is convenient and easy to use. Just open the container and start dipping. Dean’s Dip has a cool, creamy taste and texture. You can easily find Dean’s Dairy Dip in the dairy section of your local retailer next to sour cream. 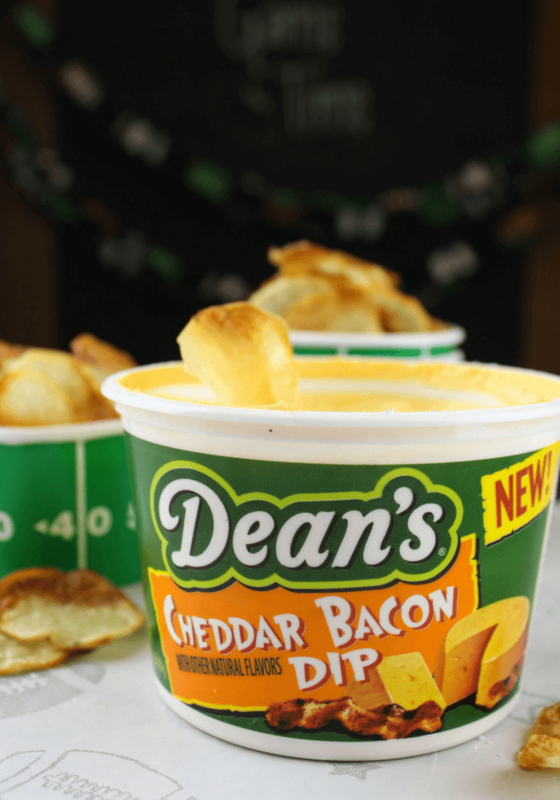 There are many delicious flavors available but I recommend the new Dean’s Cheddar Bacon Dip because it is creamy, cheesy and loaded with that yummy bacon. 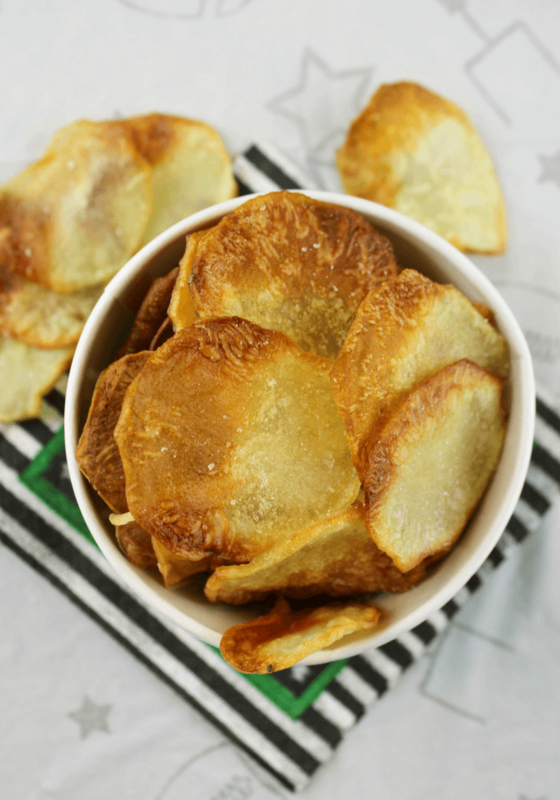 Homemade Baked Potato Chips are easy to make with only 3 ingredients! Also, feel free to add in your own mixture of seasoning for an extra punch of flavor. Add some parmesan cheese, garlic, peppercorn, herbs… whatever you can think of! These baked potato chips took some trial and error. 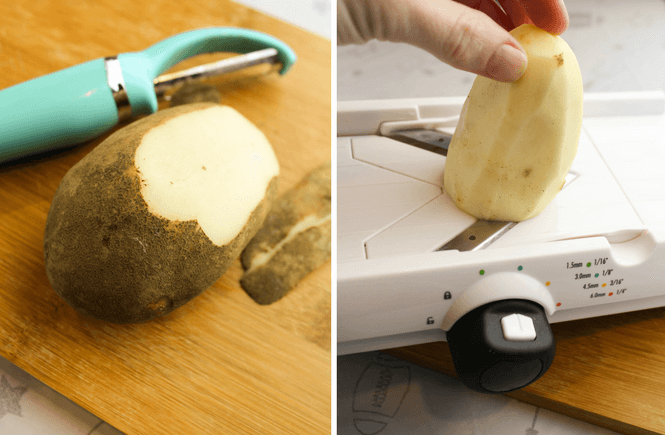 I tested out high temperatures, low temperatures, pre cooking the potatoes or not, ice baths, different slicing thickness and even multiple types of potatoes. The instructions below share my best found cooking method for the crispest, most consistent Homemade Baked Potato Chips for a game time snack that will surely be a hit. Begin by peeling the russet potatoes and slicing them 1/8 inch thick with a mandoline. I recommend using a mandoline for this specific recipe to ensure even thickness and consistent cooking. Too thick will just make a scalloped potato (delicious but not what we want for today) and too thin will be hard to work with. Once sliced, bring a pot of water to a boil and cook the potatoes for 3 minutes. Set your timer because you don’t want to overcook the potatoes at this step because they could start falling apart. Drain and set onto a towel to dry off. Dump the potato slices into a bowl, add a bit of olive oil and mix together making sure to cover each potato evenly. I do not give an exact amount of olive oil for this recipe. Just a small drizzle will work great. 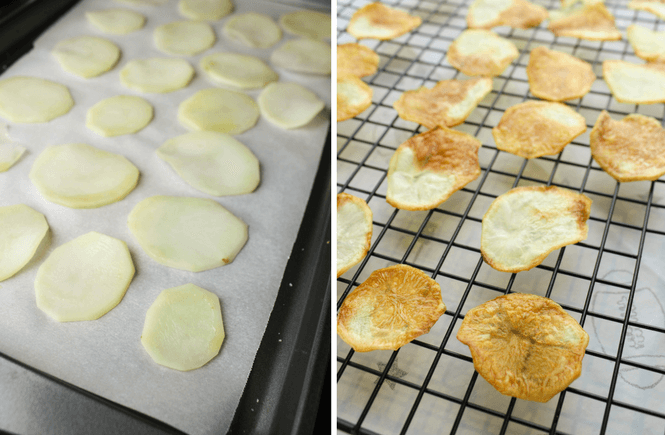 Place each potato slice onto a parchment covered baking sheet. Bake for 15 minutes. Remove the potatoes from oven to flip and then rotate the baking sheet. Bake another 15 minutes. Transfer potatoes to a cooling rack. At this point, there may be some potatoes left that need a bit more cooking so place those back in oven at 5 minute intervals until browned and crispy. Sprinkle a generous amount of Sea Salt over top as the chips are cooling. 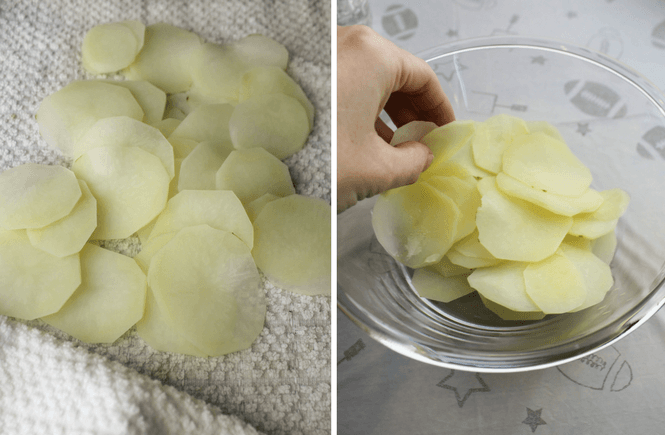 Using a mandoline, slice your potatoes at 1/8 inch thickness. Bring a pot of water on the stovetop to a boil. Drop the potatoes into boiling water for 3 minutes, remove and place onto a towel to dry. Place potato slices into a bowl with a bit of olive oil and mix until olive oil is covering evenly. Spread the potatoes onto two parchment covered baking sheet and bake for 15 minutes. Flip potatoes and rotate pan as then cook another 15 minutes. Some potatoes may need to go in a bit longer if they are not yet browned. Place on cooling rack, generously salt and let cool. The potatoes will get crispier as they cool. 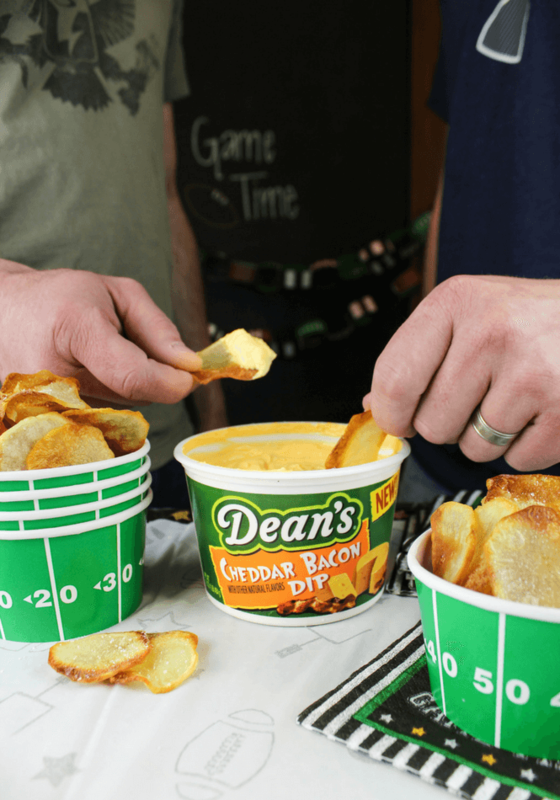 Comment below sharing your game time must have snacks and how Dean’s Dairy Dip fits into your plans this football season! 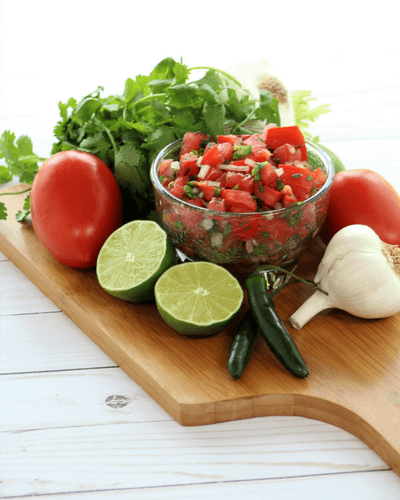 Fresh Pico de Gallo with Roma tomatoes, garlic, onion, cilantro, jalapeno and serrano peppers and a splash of lime juice. Cinco de Mayo is around the corner and I can’t help but have my mind on Mexican cuisine. 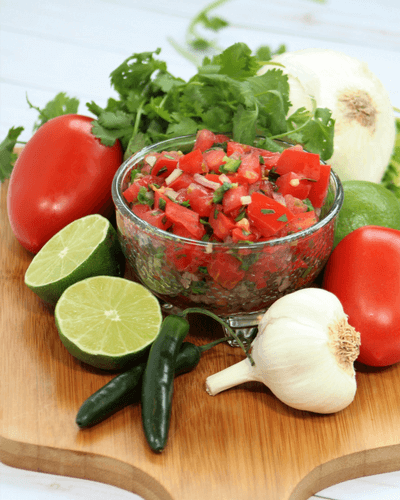 One of the simplest and freshest salsas I make is this fresh Pico de Gallo. 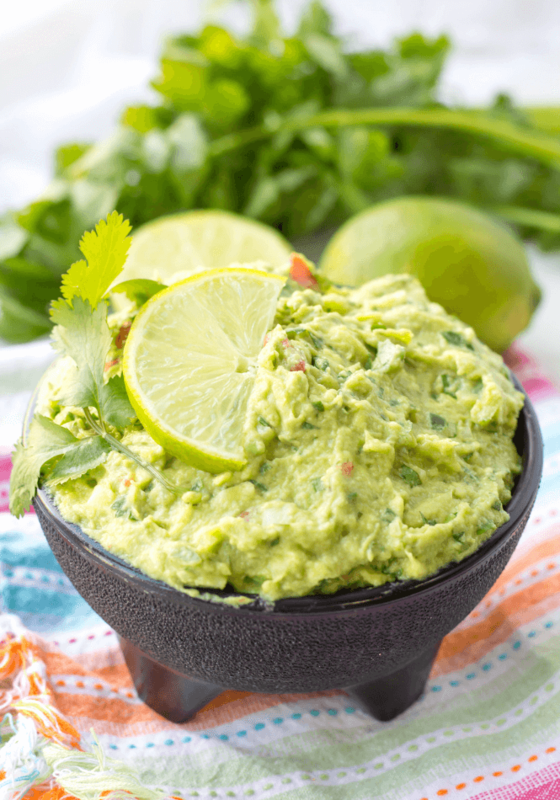 So great for a dip with tortilla chips or on top of chicken fajitas. 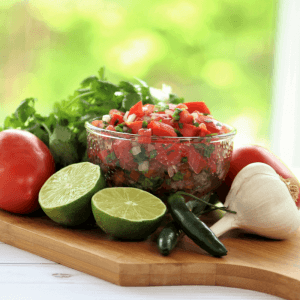 Plus you can have the salsa prepared in under 5 minutes. Winning! There are really no special tips and tricks for this recipe. It is crazy easy to throw together. Just make sure to use all fresh ingredients. 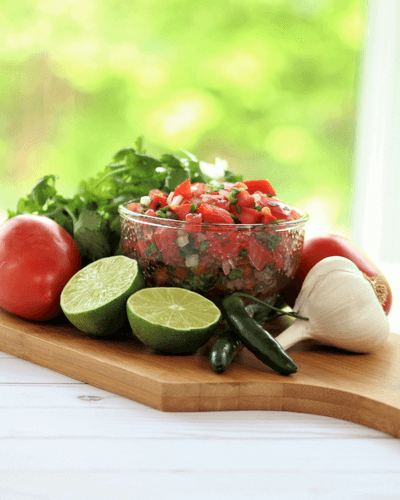 Mushy tomatoes or cilantro that isn’t green and bright, could kill the taste. If your lime isn’t very juicy, you can squeeze 2 into the mixture. A nice tip to get the most out of your lime, use the palm of your hand to roll the lime on the counter before cutting and squeezing. I have also popped them into the microwave for 20 seconds to get the most juice possible from them. 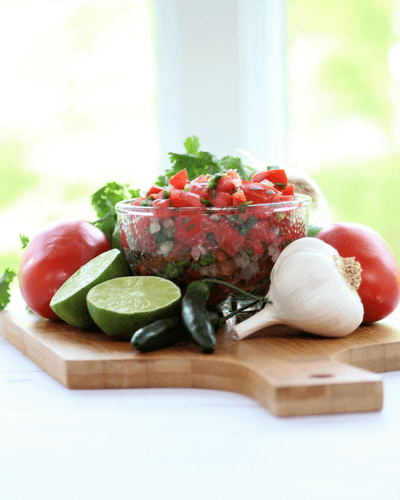 Want another great Mexican inspired dip idea that is super easy? Try the Enchilada Bean Dip from my friend over at Fizl Dizl. Wash all your tomatoes, peppers and cilantro well. Grab a cutting board and knife. Chop your tomatoes and put into a medium mixing bowl. Finely chop 1 jalapeno and 1 serrano and put into bowl. If you do not like heat, remove the seeds before chopping. Chop half an onion and put into bowl. I grab whatever I have on hand. I did a mix of red onion and white onion today. Squeeze 1 lime into bowl, add a pinch of salt and mince 3 garlic cloves. Chop your fresh cilantro and place into mixture. Corn Salsa takes only 10 minutes to prepare and has fresh ingredients with just a pinch of spice. Great for fajitas, dip or as a topping of chicken. I am a really big fan of corn, any kind of corn cooked any way. Bring me a big bowl of Corn Salsa and it will be consumed in minutes. 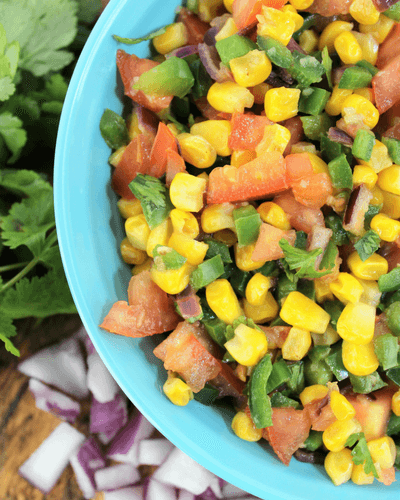 I love this recipe because the corn is the focus of the dish and the fresh ingredients just help flavor the dish. Speaking of freshness, this salsa is best when eaten immediately after cooking. The corn is warm and the ingredients are freshly chopped, just tastes so good. In a large saucepan, you want to cook your corn, onion and peppers on a medium to high heat to roast them with a little oil. This gives another dimension of flavor and the poblano chile peppers happen to taste unbelievable when roasted. Once the mixture is browned, add in the remainder of your fresh ingredients and serve immediately. Many recipes such as this one tend to taste better once the flavors have soaked in but I like this recipe served immediately while still somewhat warm. 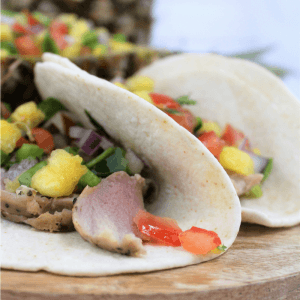 Add to tacos, use as an appetizer with tortilla chips or put over a chicken breast are my favorite ways to utilize corn salsa. This recipe goes quick! You may want to double the recipe for a big family! I took the photos and was going to make some tacos for dinner. My husband ate the whole bowl before I even fired up the stove again. Another batch had to be made for our dinner. Haha. I can’t blame him. Just too good. 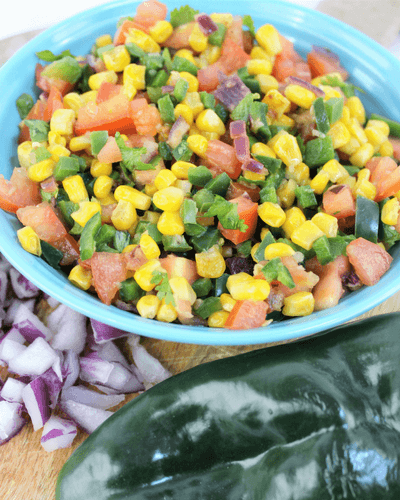 This recipe was inspired by Better Home and Gardens Roasted Corn Salsa recipe. Wash all your fresh ingredients well. Gather cutting board, knife, measuring cups, large bowl, large saucepan, spatula and garlic press. On the stove top, heat your saucepan on a medium to high heat. 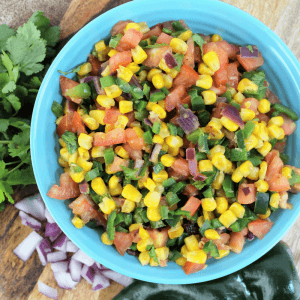 Chop your red onion, tomatoes and cilantro. Remove the seeds from your poblano pepper and jalapeno and finely chop. 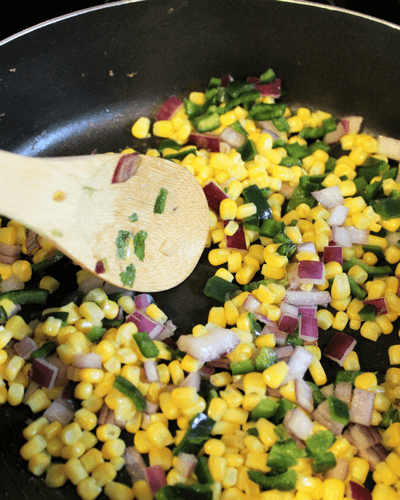 Add 1 tablespoon oil to saucepan, followed by the 1.5 cups corn, chopped jalapeno, and chopped poblano. Cook until corn begins to brown. This will take about 5 minutes stirring frequently. Turn off heat and add 3 minced garlic cloves, followed by 1.5 cups chopped tomatoes, 1.4 cup cilantro, and .5 teaspoon salt. Transfer to bowl and serve. Beefy Queso Dip is the perfect appetizer or snack made in the crock-pot. Best part? No Velveeta needed! Beefy Queso Dip has ground beef, cream cheese, Rotel, and cheese! Make little bite size snacks with a spoonful of dip on a tortilla chip with shredded cheese and a jalapeno slice or you can put inside a quesadilla for a delicious dinner! Seriously, try it in a quesadilla. You will not be sorry. 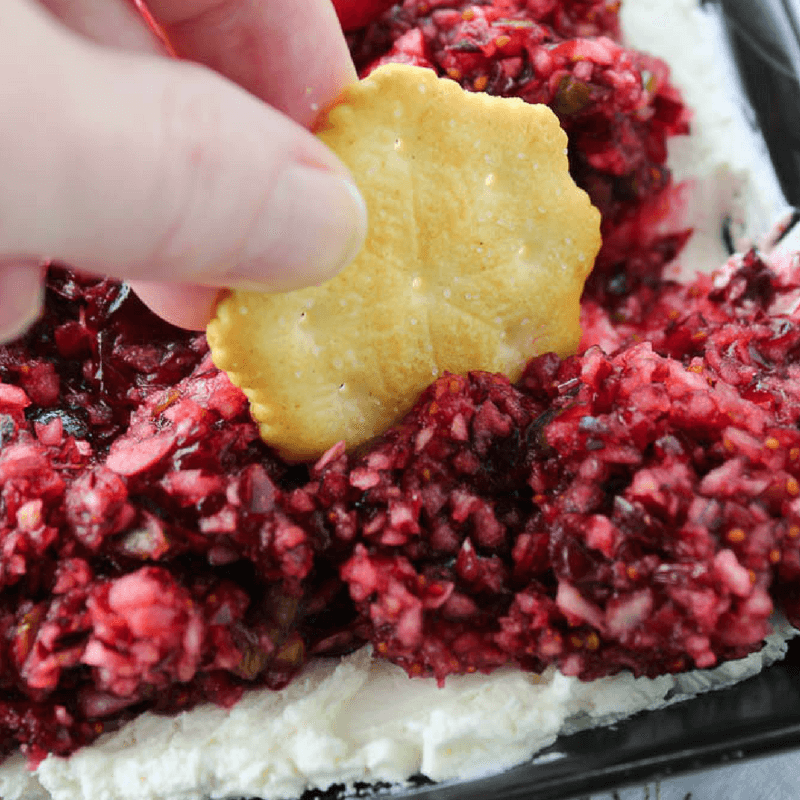 There are two ways to make this dip. One is as shown cooking the ground beef after the cheese has melted in the crock-pot and adding it on top off the cheese with some garnish on top. You can also add the ground beef in the cheese as it is cooking and have it all mixed in. Either works fine. I think adding the ground beef last just gives the dip a nicer presentation. I do not season the ground beef the Beefy Queso Dip. However, you most certainly can. Pick a taco seasoning or just some salt, pepper and something spicy. Choice is yours! Just keep it simple. I recommend using American white cheese. I have tried some other cheeses, like Pepper Jack, but the American is the smoothest. I want to achieve that Velveeta consistency without actually using Velveeta. Not that I’m not against Velveeta, I have a few great recipes for it. Sometimes, you just want some real cheese! Looks like game time to me! Go DUCKS! Gather ingredients, crock-pot, pan, knife, cutting board, and measuring cup. Cube 1 pound of White American Cheese and add to crock-pot, followed by 1 can of Rotel tomatoes (drained), 8 ounces of cream cheese, .5 cup of milk. Finely chop 1 jalapeno and add desired amount into crock-pot. We like the entire jalapeno but if you don't like much spice, try half. Let cook 1-2 hours on low heat setting. Stir the cheese a couple times while cooking. It is done when cheese is completed melted. This typically takes 1.5 hours. Garnish with some finely chopped jalapeno and tomatoes. 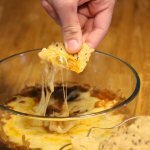 Enjoy as a dip, snack bites with shredded cheese and jalapeno slices, or in a cheesy quesadilla. Simply Made Recipes is a participant in the Amazon Services LLC Associates Program, an affiliate advertising program designed to provide a means for sites to earn advertising fees by advertising and linking to www.amazon.com. If you click on an affiliate link and make a purchase, we may receive a small commission. This costs nothing extra to you and helps keep Simply Made Recipes running! 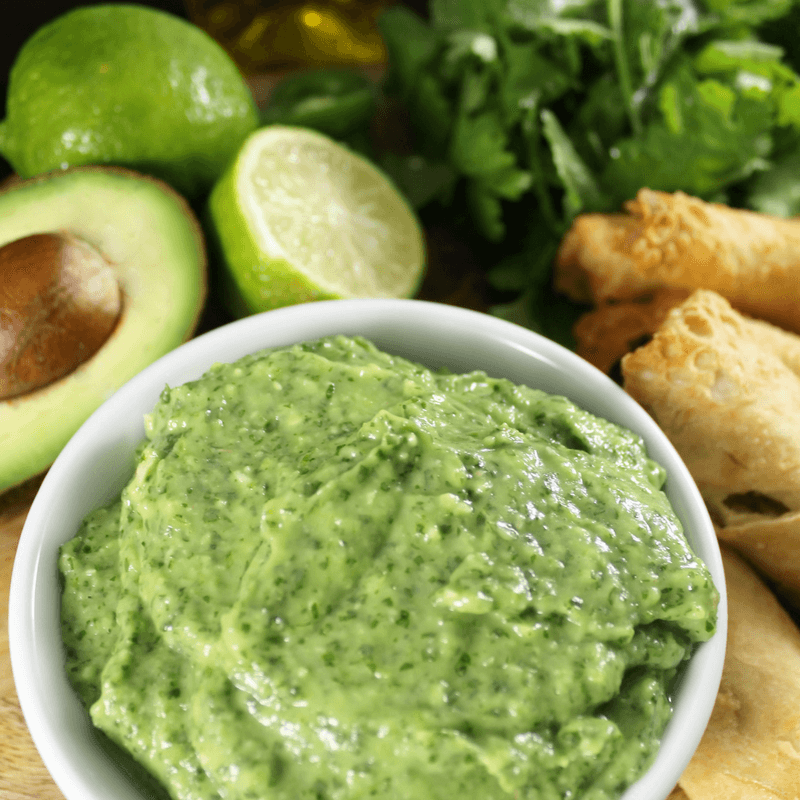 Creamy Avocado Bomb Sauce is a dressing, sauce, dip all in one. The original Avocado Bomb Sauce recipe from here at Simply Made Recipes has been a huge hit and we wanted to create a spin off recipe for you all. Creamy Avocado Bomb Sauce is spicy, packed with fresh cilantro and garlic and has a nice creamy base. Why do we love this recipe? You can literally use it on everything. 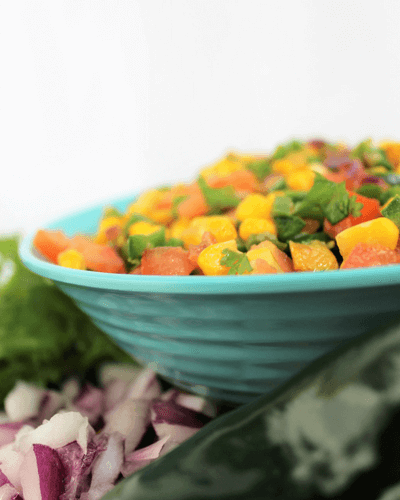 Top your fajitas, burrito bowls, eggs, toast, chicken fingers, salads and whatever else you can think of. Our favorite use for Creamy Avocado Bomb Sauce is on top of ground turkey tacos made with ground turkey, cabbage, tomatoes, taco seasoning in a soft tortilla. The sauce replaces the need for guacamole, salsa and sour cream. Also, is a great healthy swap on salads of a ranch dressing. Creamy Avocado Bomb Sauce can be stored in the refrigerator in a sealed container for around 5 days. Corn Dip is a perfect snack or game time food and so simple to cook. You literally dump all the ingredients into a crock-pot, finely dice a jalapeno and let the ingredients cook for 3 hours. I learned a variation of this recipe from an old co-worker a few years back who would bring this dish into our pot luck lunches and it was always a huge hit and have been making this for my own friends and family ever since! It is nice and creamy with tons of corn and a nice flavor from the green chiles and a little kick of spice. Be careful though because this Corn Dip is so incredibly addicting and you won’t be able to put it down! Gather ingredients, crock-pot, cutting board, and knife. Pour 2 pounds of corn into crock-pot. Turn crock-pot to low heat setting. Cube 16 ounces of cream cheese and put into crock-pot followed by 1 cup sour cream. Diced the jalapeno. If you do not like a lot of spice, you can remove the seeds before dicing or use half a jalapeno. Dump into crock-pot. Serve with some tortilla chips or Fritos. 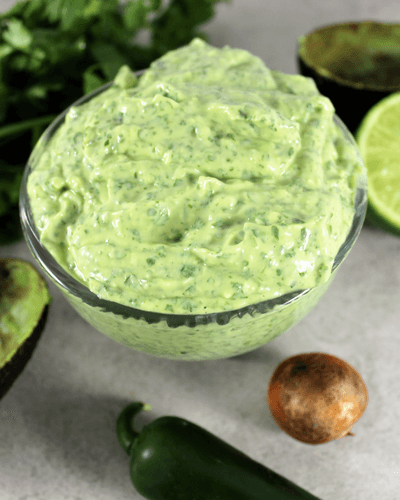 The “Bomb” Sauce as Aaron calls it, is an avocado sauce you can use for almost anything! 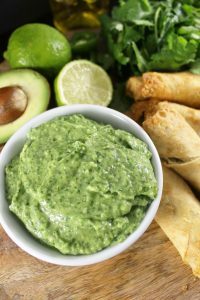 The Avocado Bomb Sauce is a must have recipe. How did we come up with this sauce? Our Firehouse Guacamole. 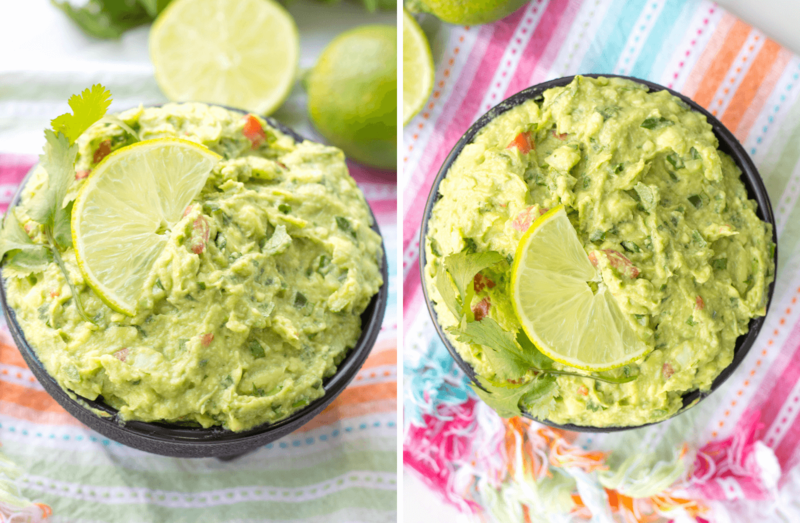 We simply utilized ingredients from our favorite guacamole and twisted them into a sauce! Use it as a dip for egg rolls or chicken strips or some tortilla chips. Use it as a nice creamy dressing on top of a salad, like a Chicken BLTA Salad. Dress up some steaks or chicken or even omelets. Pour some on a Breakfast Muffin. Yum. 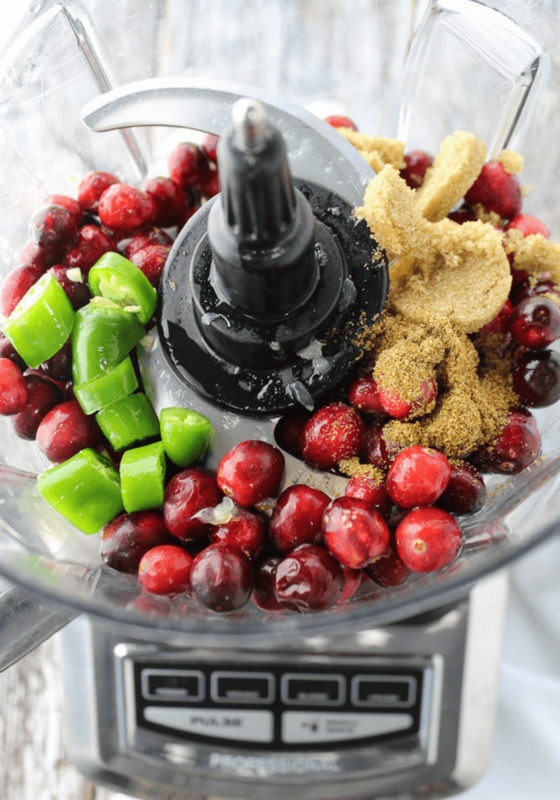 So easy to make, all you need is a food processor or blender. We LOVE this sauce, hence how it got it’s name as The “Bomb” Sauce! 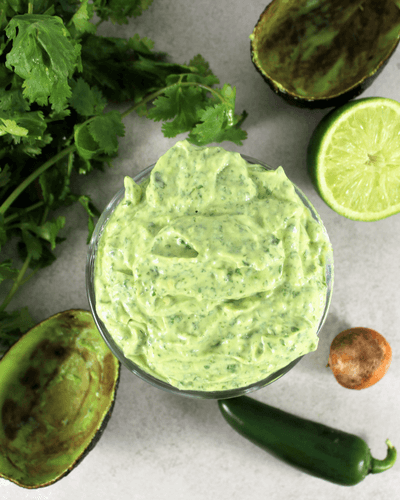 Make this sauce your own by adding more lime, less cilantro or try our Avado Bomb Sauce spin off of Creamy Avocado Bomb Sauce also on the blog. For a great Avocado bomb Sauce, you want really fresh ingredients. Smell the cilantro (just because I love the smell) and make sure fresh and it isn’t browned and wash very well for cilantro can have a lot of dirt in it. Get a nice juicy lime. A nice trick to getting the most from your lime is to roll it on the counter with the palm of your hand to get those juices ready. Make certain the garlic is fresh and not brown anywhere and a grab a nice bright green jalapeno. Did you know that spiciness of a jalapeno can be seen from the outside? If you like it spicy, which this sauce is, look for vertical striations on your jalapeno. If you don’t like spice, stay away from these striations(they look like stretch marks) and remove seeds before blending! Avocados. Avocado can be tricky to pick, especially during certain seasons of the year. Look for avocados that are browned on the outside but not yet squishy. They should be slightly firm still. Stay away from bright green avocados because those are not yet ripe enough and put down anything too squishy. Lastly, let us talk about olive oil. There are many, many different varieties of olive oil. We always go with extra virgin olive oil and stay in a mid price range. I do recommend trying different varieties of olive oil because they do taste different and find what suits your taste buds. Also, I have heard that olive oil actually goes bad in a short time period even though expirations show a couple years! So if you have been using the same olive oil for 6 months, toss it and buy a new bottle. Some even recommend to replace your olive oil 30 days after opening. How long will Avocado Bomb Sauce last and how should you store it? I get asked this all the time. I think Avocado Bomb Sauce can stay good in your fridge for around 5 days. You want to make sure it is in a tightly sealed container and if the very top browns from oxidation, which will happen avocados love to brown, remove the top layer and everything underneath is perfect! The lime and olive oil help preserve the sauce so it can last days. Although, it is so delicious so it probably won’t even make it 48 hours before being completely consumed. This recipe was first published July 17, 2016 and updated on October 28, 2016. This is one of our most popular and most loved posts! Enjoy! 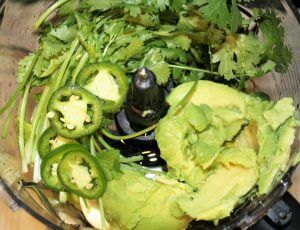 Add 1/4 cup extra virgin olive oil, 1/2 jalapeno, 3 garlic cloves, pinch of salt and 1/2 bunch of cilantro into food processor. If you do not like heat, remove seeds of jalapeno beforehand. Do a taste test. You may need to add more salt or squeeze more lime depending on your personal taste. If you would like a thinner sauce, for a dressing possibly, add just a touch of water to thin out. Start with 1/8 cup of water but the water is not necessary. Pour into a container and eat up! Egg roll dip, on top of salads, over a steak, eggs, salmon so many options! 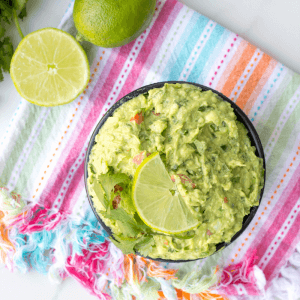 Firehouse Guacamole is made with all fresh ingredients like avocados, tomatoes, cilantro, onion, garlic and peppers for a completely addictive snack food that is healthy and delicious. 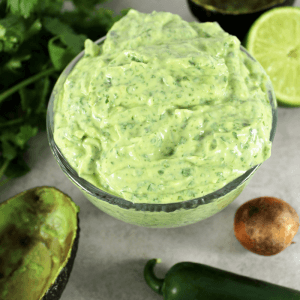 This Firehouse Guacamole is a recipe that Aaron originally learned while working at the firehouse from one of the guys who claimed it as a copy-cat Chipotle guacamole recipe. 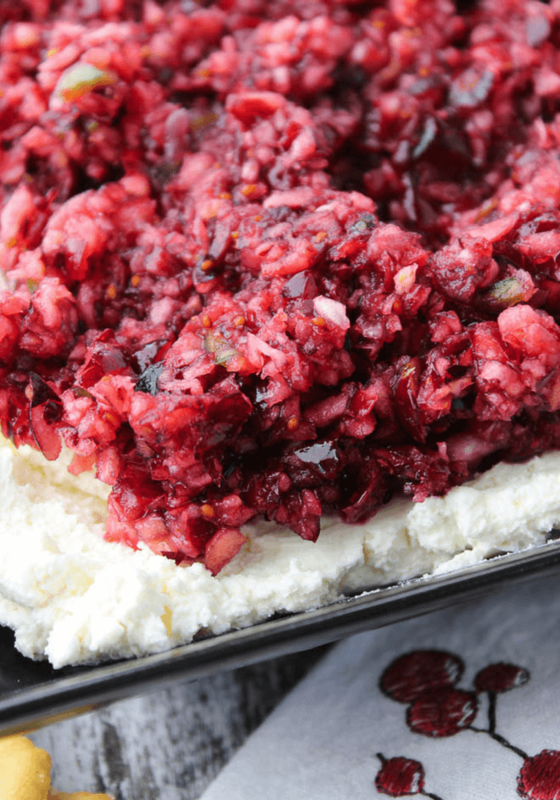 The recipe evolved into the one I give you today and I promise it will be a hit for your family! Even our one year old eats this by the spoonful. This is the BEST guacamole ever! Put the guacamole on fajitas or with our Burrito Bowls with Creamy Enchilada Sauce recipe, some omelets in the morning, or use as dip with tortilla chips. Yum yum! Check out Firehouse Guacamole Burger for a delicious burger idea! Wash fruits, vegetables and herbs well. Grab a large bowl, large spoon, spatula, cutting board, garlic press and favorite knife for fine chopping. Cut all 4 avocados in half and remove seeds. Put the seeds to the side because you will need them for later! Using a spoon, remove the skin of the avocados and put the good stuff in the bowl. I use the spatula to mash up the avocados until they are in a paste like consistency with some chunkiness. I DO NOT recommend using a food processor for the guacamole because I find the flavors stand out more when everything is a little chunky and tastes more authentic. 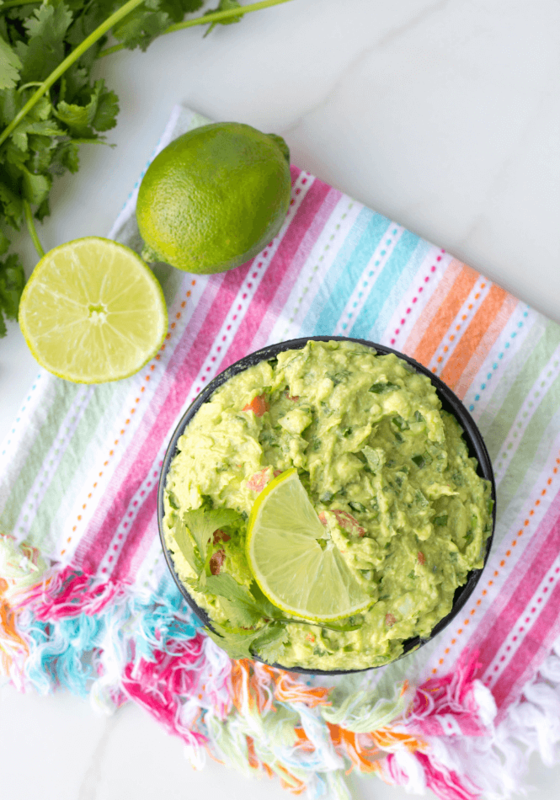 Why make a homemade guacamole to have it taste like a store bought one? Keep it slightly chunky. Trust me. Finely chop 1/2 of a white onion. If you love onion, you can put the whole thing but I find onions to be a little over powering. My chopped onion came out to 1/2 cup. Put onion into bowl. Finely chop 1 tomato. Typically I use Roma tomatoes because I love the flavor but use what you have in your garden or what you would typically buy. Today, I used a garden tomato. My chopped tomato measured out at 1/2 cup. Put into bowl. Finely (very fine!) chop 2 Serrano peppers. We grow jalapenos in our garden so I have used this recipe with 1 Serrano and 1 jalapeno also and it turns out great. Put into bowl. De-stem leaves with the cilantro and finely chop the leaves. The more finely chopped the cilantro is, the more taste it puts out. Cilantro measured out at 1/2 cup chopped. Put into the bowl. Minced garlic and put into bowl. Salt to preference but I used 1/2 teaspoon today. Cut lime in half. Squeeze both halves into bowl. I always roll my lime on the counter using my palm beforehand to get it nice and juicy. Mix all the ingredients together with the spatula. Put the seeds back into the guacamole! This helps preserve the guacamole and will last longer!